Preheat oven at 175C, Grease a 9" bundt pan, and dust flour or spray non-stick spray in pan. Beat butter for a while and add in sugar, continue to beat butter until creamy. Add eggs one at a time and mix well. Add orange rind, orange juice and vanilla extract, beat at low speed till well combined. Split ingredient (B) into 4 portions and sour cream into 3 portions. Pour in one portion of flour and sour cream alternately, beat well after each addition. Take half of the mixture and gently mix with melted chocolate (do not over mix). Scoop plain and chocolate batter alternately into pan, till all the batters are used up and gently shake the pan a little. Bake for 50-60 minutes or skewer comes out clean. Remove cake from oven and set to cool for 20 minutes then unmould, leave to cool completely. Looking at this cake you might think this is a chocolate cake. No,this is not a fully chocolate cake. Can you see there is some marble effect on the dark cake? Just because I've overbaked the cake for slightly more than 5 minutes, the cake got almost burnt and this is the result. 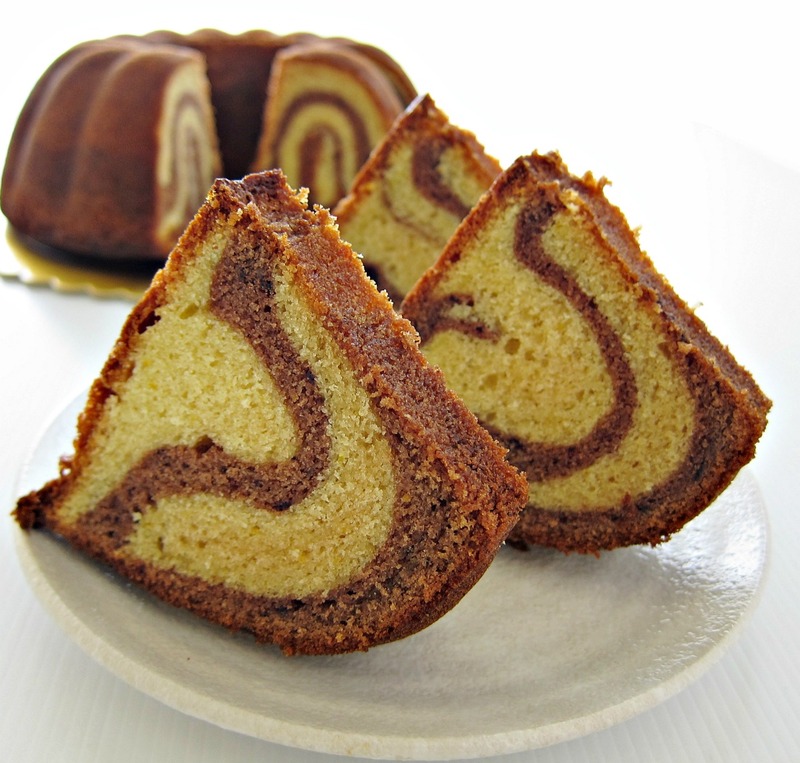 Luckily the cake is still soft and tastes good with the sweet aroma and citrus flavour. 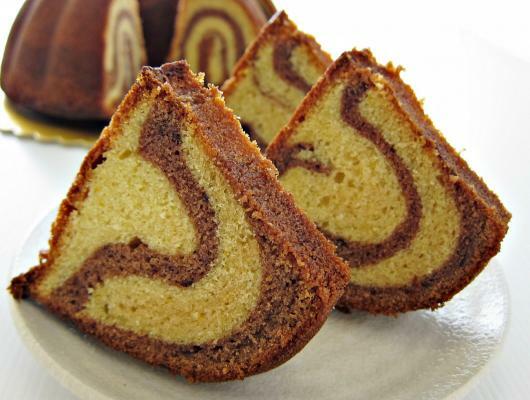 I'm also not very disappointed because the chocolate swirl inside the cake looks very pretty.